Motherboard reveals ahead of their official launch date are rarely isolated incidents. Competition pressures from all corners drive a demand not only to see, but to be seen. 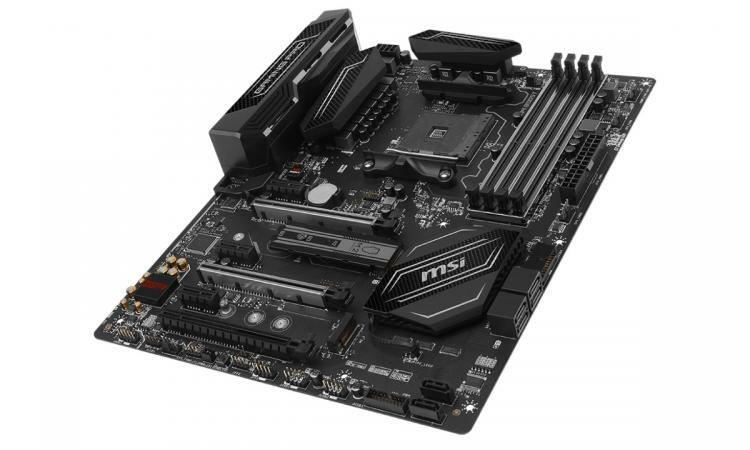 So it's not exactly astonishing that just after ASUS ROG's Crosshair VII Hero posed for the cameras yesterday, a major motherboard model from another manufacturer just happened to come to light. In this case it's MSI's X470 Gaming Pro Carbon AC, a high end design with stylish aesthetics and performance chops. The images - again via Videocardz.com - are stock images rather than the distinctly amateur photos of the Crosshair VII Hero, indicating that they may have got their hands on some of the marketing material. They're also in blessedly high resolution and with good contrast, so picking out features is pretty easy. One further point that should be made is that although not labelled as 'X470', the board is sufficiently different from other known AMD Gaming Pro Carbon motherboard to be confident that it is indeed based on the new chipset. Once again, a change in component distribution from the X370 Gaming Pro Carbon AC (shown below) indicates that there's been a fairly substantial redesign, although (in contrast to the Crosshair VII Hero WiFi) core features appear to have at least remained at parity. 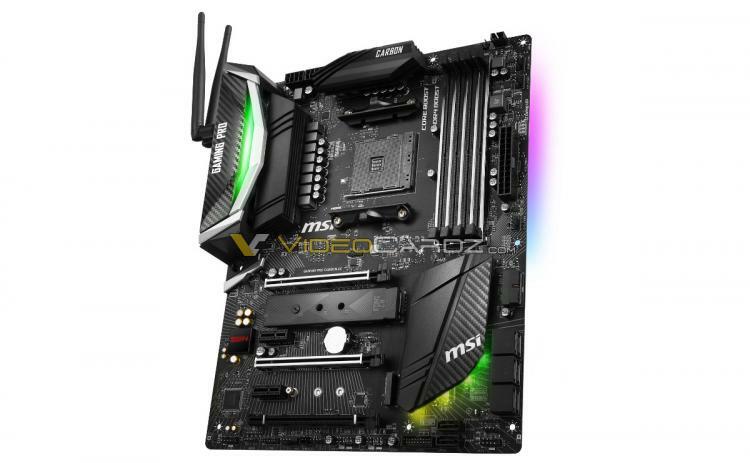 This model retains the two M.2 slots (one of which uses the MSI M.2 Shield heatspreader) for example, but also incorporates a couple more SATA III 6Gbps ports. Also, Wireless AC module has been broad on-board rather than provided via a PCI-Express add-in card. Sadly we're not given a glimpse of the I/O panel, so it's currently unknown whether this model slims down the number of USB ports (of all stripes) and if it supports video-out in any capacity. 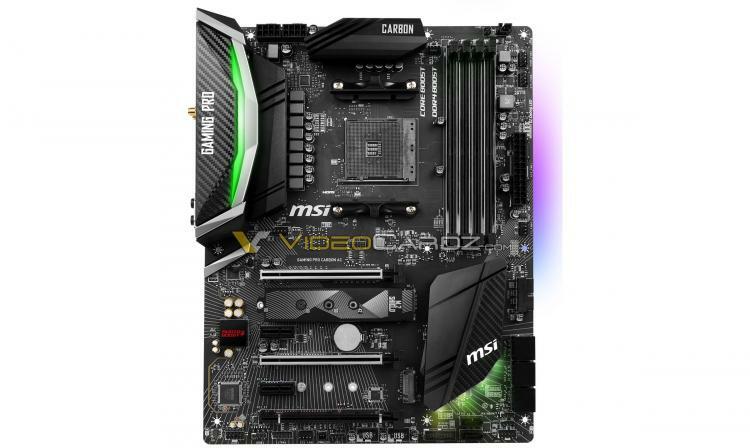 Aesthetically, the Gaming Pro Carbon line of AMD motherboards appears to have been updated to reflected the aesthetics of a more recent Intel Gaming Pro Carbon model: the Z370 Gaming Pro Carbon. This also includes RGB lighting, apparently mandatory by law now even on the restrained monochrome of the Gaming Pro Carbon line. The X470 motherboards are expected on April 19th, and you can also expect more 'leaks' in the weeks to come.